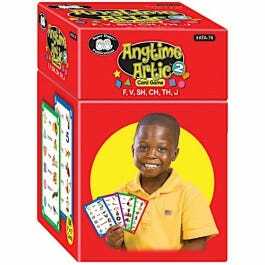 Anytime Artic helps children expand their vocabulary and practice target sounds SH, CH TH, J, F, V in all positions. 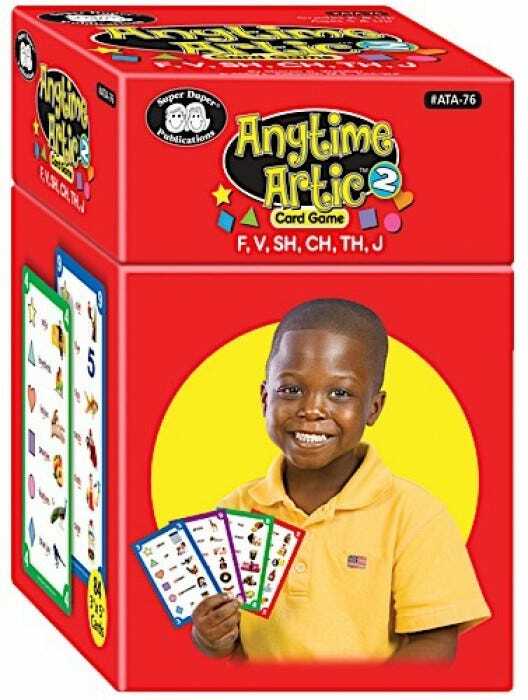 Game provides multiple opportunities to practice SH, CH, TH, J, F, and V in initial, medial, and final positions of words. Each card has six different sound targets identified by shape. Deal seven cards among two to six players, then assign a shape/target sound to each player. Students take turns discarding cards by matching colors or numbers as they practice their target sounds. First player to discard all his/her cards wins the game. Includes content cards and game ideas. Color photos representing the target words make this game fun for readers and nonreaders alike. Grades K and up.